Your environmental group has produced an attractive coffee (or tea) mug featuring the Four Seasons design from our web pages. Final mug design is by TMAEG member Bill Forster, based on the initial work of Lucy Williams. 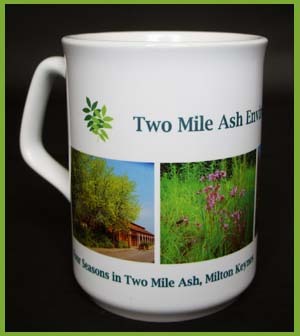 This limited edition souvenir costs just £5 per mug and can be delivered to homes in Two Mile Ash.